“AlphaGo” — the 2017 documentary about the 2016 showdown between the AlphaGo AI and Lee Sedol, is now streaming on Netflix. 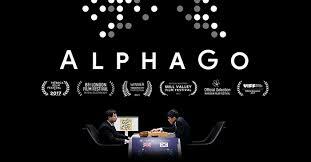 Directed by Greg Kohs with an original score by Academy Award nominee, Hauschka, AlphaGo chronicles a journey from the halls of Oxford, through the backstreets of Bordeaux, past the coding terminals of Google DeepMind in London, and ultimately, to the seven-day tournament in Seoul. As the drama unfolds, more questions emerge: What can artificial intelligence reveal about a 3000-year-old game? What can it teach us about humanity? Both “AlphaGo” and “The Surrounding Game” – which follows the lives of three young Americans vying to become the first-ever Western professional players — will screen later this month in Portland, OR. The Surrounding Game screens on Jan. 13th at 7:30 and AlphaGo on Jan. 14th at 7:30, both at the Documentary Film Center (corner of NE Williams and Tillamook). “We’re also going to hold a small teaching session at 6PM on the 14th for new players to learn how to play the game. Players can sign up on the 13th for the free teaching session,” reports Peter Freedman.